I have a challenge for you (and me) today. I challenge us all to start making a giant fresh salad on Sundays, so we can eat salad all week long. 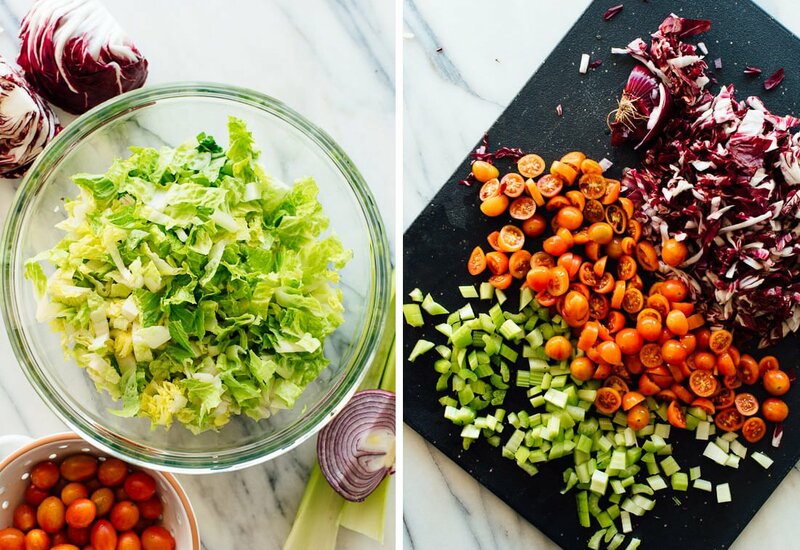 Starting with this gigantic, colorful, dare-I-say the best Italian chopped salad. 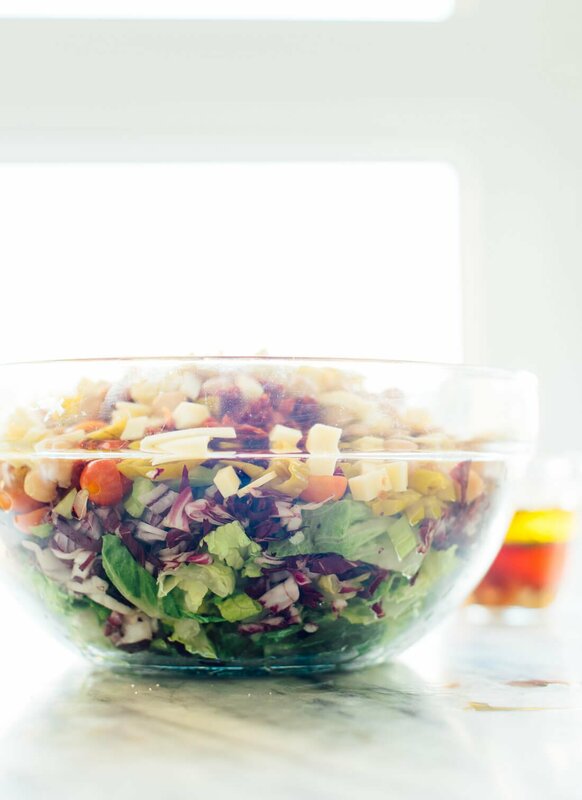 When you have a really great salad in the fridge, you might even reach for it before you grab the bag of chips. Happened to me! I’ve enjoyed four iterations of this salad over the past couple of weeks (especially the final version you see here), and I’m still craving more. The motivation behind this salad recipe came when I ordered an Italian chopped salad and a pricy Neapolitan pizza down the street. I requested the chopped salad without the bacon, and it was definitely missing that salty, savory, gimme-more edge without it. Crispy bacon is the only meat I ever miss. I set out to create a better meatless Italian chopped salad, and here it is. You’ll find most of the usual ingredients, including crisp lettuce, radicchio, red onion, fresh tomatoes, pepperoncini peppers and provolone cheese. I tried a few other kinds of cheese, but it’s no wonder provolone is the most common—it’s the tastiest. That said, you could easily skip it for a delicious dairy-free/vegan salad. You’ll find a few unexpected ingredients here that send this salad over the top. 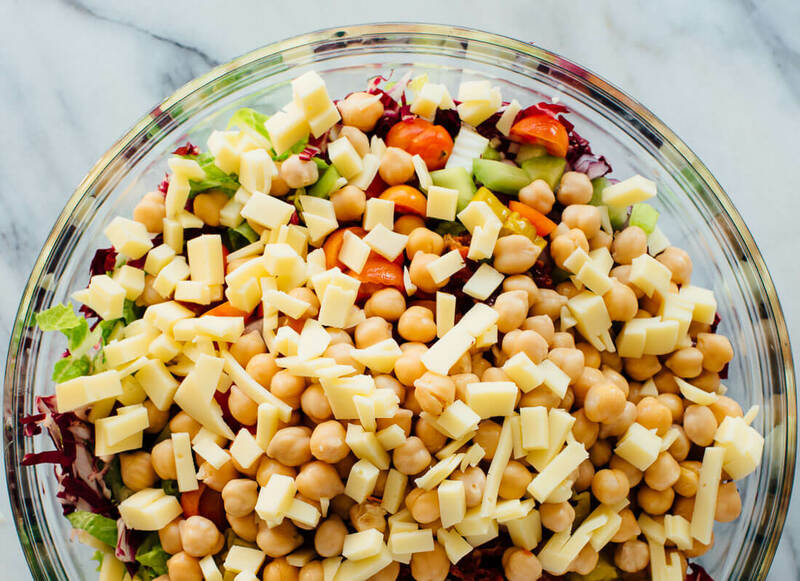 First up, chickpeas, which aren’t uncommon but make this salad more hearty. I also added celery for extra crunch, and sun-dried tomatoes for some extra oomph. The umami flavor in sun-dried tomatoes make up for the umami-rich pork that you usually find in Italian chopped salads. 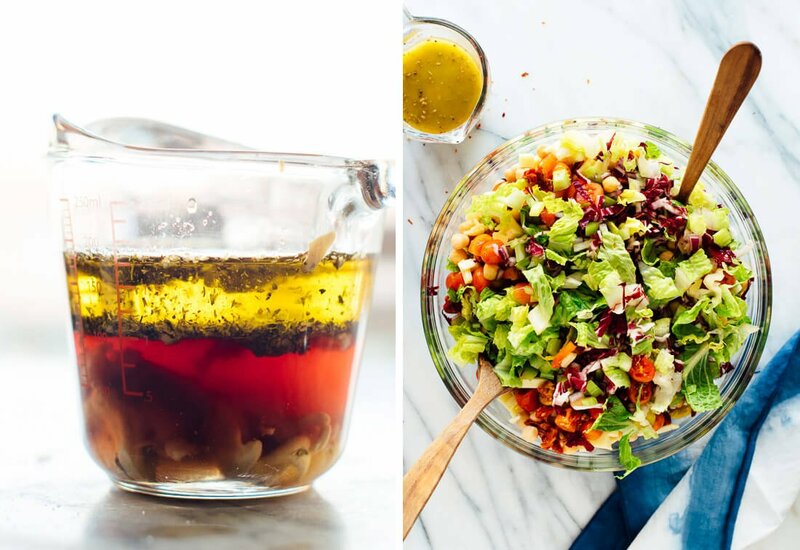 Toss all of those ingredients in a bold, homemade Italian vinaigrette and you will have a seriously addictive salad. I’ve enjoyed smaller portions as a side or larger portions as a light meal. Please let me know how you like this recipe in the comments! Your feedback is so important to me. Craving more big chopped salads? 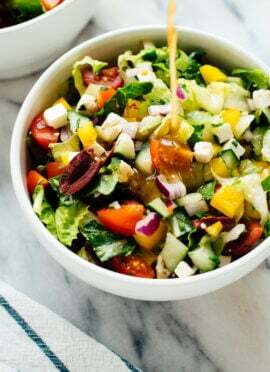 Don’t miss my Chopped Greek Salad, Colorful Chopped Salad with Carrot Ginger Dressing, Mexican Green Salad with Jalapeño-Cilantro Dressing or Fattoush Salad Recipe. Truly the best Italian chopped salad recipe, with chopped fresh greens and veggies in a simple Italian vinaigrette. This salad is vegetarian and easily vegan. Recipe yields 6 to 8 side servings or 3 to 4 meal-sized servings (a lot). If you store the salad separately from the vinaigrette, it will keep well for up to 4 days. 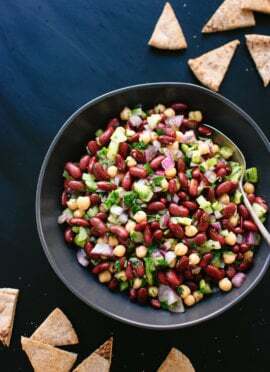 In a large serving bowl, combine the chopped lettuce, radicchio, onion, celery, cherry tomatoes, peppers, sun-dried tomatoes, chickpeas and cheese (if using). Toss the ingredients together and set aside. To prepare the dressing, combine all of the ingredients in a liquid measuring cup. Whisk until blended. Taste, and add more salt if the dressing doesn’t knock your socks off (I usually add one to two more pinches of salt). If you’ll be serving all of the salad at once, go ahead and drizzle enough dressing in to lightly coat the salad and toss to combine. I prefer to store the salad and dressing separately so I can enjoy salad for a few days. 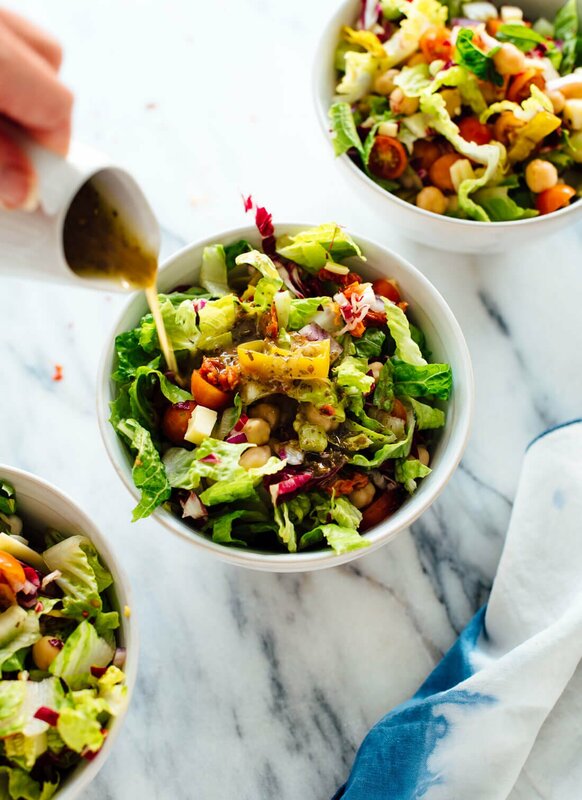 Just whisk the dressing again before drizzling (if the olive oil solidifies a bit in the refrigerator, don’t worry, that’s normal—just let it warm up for about 5 minutes at room temperature or microwave for 10 to 20 seconds). Recipe inspired by the chopped salad at 1889 Pizza and created with reference to Smitten Kitchen and The Kitchn. Make it dairy free/vegan: Omit the cheese! It’s still great without it. For a vegan dressing, substitute maple syrup for the honey. 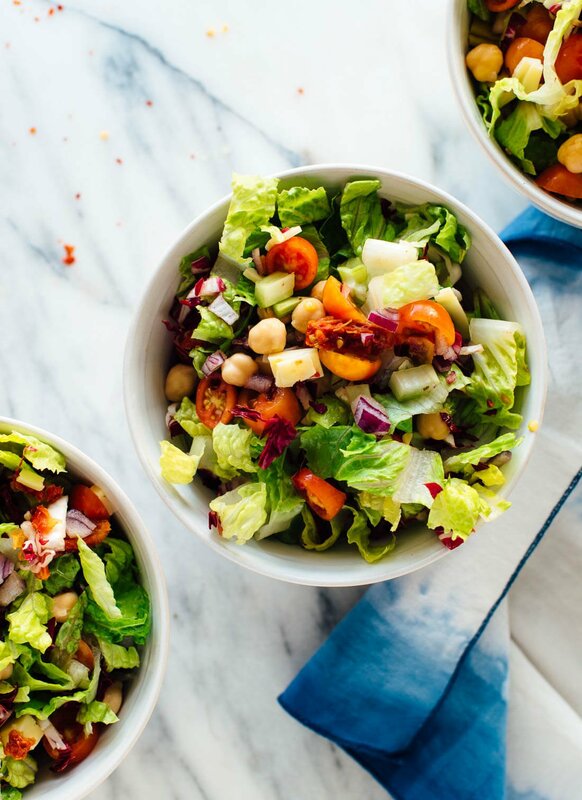 *Romaine and radicchio notes: If you want to make this salad in a hurry, just buy two bags of chopped romaine/radicchio mix, and chop it into even smaller, bite-sized pieces. Radicchio is very bitter and can be hard to find, but I thought it added something special to this salad. If you hate it/can’t find it, skip it. If you adore it, feel free to use the whole head. I love this challenge. Such a great idea. And it is science-backed. Having pre-prepared healthy food visible has been shown to improve food choices! And your salad recipe looks delicious. Thank you. Who knew my suggestion was evidence-based?! That’s great. Thank you, Esther! Omg you have the same name as me, are you Jewish? I couldn’t agree more— when I have a tasty salad in the fridge I just eat it over and over until it’s gone! This looks so fresh and flavorful. I’m definitely trying this VERY soon! Yes! Apparently it’s science-backed, thanks to the wisdom of another commenter: having pre-prepared healthy food on hand and visible leads to healthier food choices. Kate, your recipes have inspired me during me now-12-months of switching to a plant-based diet (mostly vegan)! I love the techniques I’ve learned. I’ve been making 5-6 pre-made salads every Sunday all year; I usually make a soup also. During the summer I’d make 2-3 types of yummy salads. Those Sunday cooking sessions have become really special me-time, and having the food ready all week has saved me from plenty of junk food! This salad will be next on my list….thanks, as always! Nancy, that’s amazing to hear! High five! I hope you love this one. This looks delicious, I say this as I stuff a chocolate bar into my mouth, feeling guilty that I am so rubbish at eating well. I’m going to make it my mission to make this salad this week and to post a pic on instagram as evidence! Need all the help I can get shifting this last bit of baby weight and getting healthy. I love salads! I can literally eat them every day; all kinds. However, I’m not sure why but, they are my least favourite thing to prepare. Your idea is absolutely brilliant! I usually spend either Saturday or Sunday preparing my food dishes for the week. It’s so much easier, after a long day of work, to come home and have a healthy and home-made dinner ready in a matter of minutes. Thanks, Lynnie! It’s been quite a relief to have a hearty salad in the fridge to grab. I love a combination of cabbage, diced chicken, peanuts and chia seeds..plus any handy vegetables. you could make it ahead but it just takes seconds to throw it together. I love this plan! Can you recommend more salads that are hearty enough for lunch and last well through the week? Hi N! I just looked at my salads page and they would all keep pretty well. 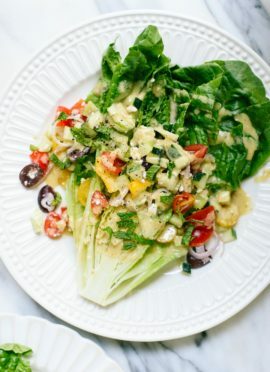 The trick is just to store the dressing separately from the rest, because the acidic components in the dressing breaks down the greens—you just don’t want to mix them together prematurely. Kale salads are particularly hardy. Hello, first time commenting on your blog but I have loved trying a lot of your recipes! How do your store your salads for a few days use? I usually like salads prepared just before eating so very interested to know more! Hi Sarala, so glad you’ve been enjoying my recipes! I just prepare the salad and dressing and store them separately in the refrigerator, covered with plastic wrap. I just want to tell you how much I enjoy your blog. At the end of the day when I open my email and see a new recipe waiting in the inbox, I feel a little flutter of delight. Your website is soothing to look at, your writing is witty and comforting, and your recipes are absolutely DELICIOUS. I cook one almost every week. Even this font for writing comments is super satisfying. Thank you for gathering this community together. I am happy to be part of it. Davi, thank you so much! Your comment made me smile big. I’m so glad you appreciate this website; it’s my baby! Love the challenge! Pls keep posting more fab looking and hearty salad recipes to keep us going! Made your salad tonight, and it was so fresh tasting. The dressing truly is delicious. When my husband comments, you know it’s great! Yay, I’m so glad! Thanks for letting me know, Kathryn. Hi! This salad looked so yummy I made my own with what I had on hand. Thanks for the amazing inspiration! I hope you like it, Maria! Forgive me, my wife is the veggie eater in the family and I’m… getting there. I realllly don’t like Radicchio, what could you suggest I replace it with? Hi Benny, I’d just omit it! I love this kind of salad and totally want in on the Sunday salad pledge! I also love that you used dried oregano in the dressing. That’s such a classic taste I associate with these other ingredients. Yum!! Yes! Those traditional elements are the best part. Made the chopped salad yesterday. It’s delicious, and there’s plenty leftover for today (since it’s just the two of us). So withholding the dressing is a great idea. Thanks for posting it! I made this salad the other day and it was awesome. Didn’t have radicchio or pepperocinis but it was still great without them. It was a great “main” salad – even my 3 boys liked it! I made this salad yesterday and it was wonderful, full of flavor, fresh and crunchy and the dressing was perfect. So nice knowing there is some left for lunch today. Challenge accepted, Kate! And the salad was great! I needed the motivation after a long week of musicals for my daughter and studying for my exam. One more week of studying to go and I bet with this challenge going I will finish strong on that test! I hope you ace that test, Kecia! Thanks so much for the kind words. Kate – Challenge accepted. I made this salad on Sunday and now that it’s Monday, I’m totally thankful I have this delicious lunch to enjoy! As always, thanks for the great recipe. Your blog is my absolute favorite. That’s such a good feeling, Heather! I’m so glad you can enjoy this many times over. Awesome! We’re having an early spring here in Kansas City, so I’ll send warmer vibes your way! The Italian vinaigrette dressing is delicious. I need to make it in a larger quantity. Loved the idea and the simpleness. Its really easy to prepare and looks so tasty. Definitely do this tonight. Thanks for the awesome and obviously great looking Vegetarian Italian Chopped Salad. Made this without provolone and it was still fantastic, thank you for another great recipe. Really looking forward to your cookbook! I’m so excited for everyone to see it, Megan! Thanks. Made this last night and it was a huge hit with the kids and adults. Delicious! This may be my new favorite! Thank you! I came across your web site by chance and think it’s great! My husband and I eat alot of vegetarian meals although we’re not strictly vegetarians.There are some great recipes on your web site which I plan to try out. However …I’m missing the breakdown of vitamins, minerals,fat, carbs, calories etc. in your recipes. I don’t really need to count calories but I do like to know how many I’m consuming! Hi, Sharon. So glad to hear you and your husband enjoy my blog! Unfortunately, I don’t have nutritional info available for my recipes just yet. I’m looking for a solution, and will update about it once I find one. Thanks! I omitted the radicchio because it cost $5.99 a pound and the store only had fairly large size heads. I also omitted the pepperoncini peppers because every option at the store had yellow food coloring added. I added finely diced red peppers for a little added crunch. Loved the vinaigrette! Packed the left overs for lunch and it kept very well! Thanks Kate. I made this salad this weekend. I want to commend you because my family loved it — including my salad-hating 14-year-old son! Also, they liked the dressing as well. When I first made the dressing, I was a little skeptical but after sitting in the fridge overnight, I was a fan too! I had some for lunch today and plan to use it to get more vegetables into my kids. I’m so glad this helps you sneak in some more veggies, Dominique! Yes, I like letting the flavors sit for a bit so they can deepen. I’m so glad you like it! Looks ever so good. Thanks for being so generous with your recipes. I appreciate your interest in health and organic foods. It probably doesn’t matter much, but the line in the recipe: 1 cup (4 ounces) ¼″ cubes of provolone cheese (optional). Maybe you meant 1/2 cup of cheese because 1 cup is 8 oz. I bought your new book today on Amazon and will write a good review in a few days. Again, thank you so much for your tireless effort to make us all healthy. Cookie is cute. Hi Kate – I have to say that this chopped salad is my new favorite. I especially love the dressing which is half/half oil and vinegar. I love the extra bite of the vinegar and peperoncino. This is a new standard recipe for me. Perfect for lunches and work. I’ve tried quite a few of your recipes and everyone has been very good. So glad to have found you online. I’m so glad you found my blog, Pam! I dig this salad, too. Love your salad ideas. What can you use instead of oil in salad dressing recipes? To me the dressing makes the salad. Hi Kat, I agree that the dressing makes the salad. Olive oil actually helps the body absorb some of the nutrients in greens, tomatoes, etc. so I wouldn’t recommend making an oil-free salad. There’s really not an equivalent alternative. Tahini or avocado can make creamy dressings but they will greatly affect the flavor. A few days ago, I received your book Love Real Food which I ordered in advance. I am not a vegetarian, but I could easily become one. This is going to be my go-to cook book. Thank you for all your hard work and thank you for your blogs. You’re welcome, Phyllis! Thank you so much for picking up the book– I hope you love it! I LOVE this salad! I make it without chick peas and cheese if I want it as a side salad, or as-is for a filling dinner or lunch option. The dressing is so good. Excited to try some new recipes from your cookbook which I pre-ordered! Thanks, Kristen! That variation sounds great as a side, too. I hope you like the book! I made this last night without chickpeas or cheese as a side salad last night for guests and it was great. My husband doesnt normally like salads as a main at dinner but he liked it enough I made another one tonight with the chickpeas as our main. It’s so good!! I added peppers because I like the added crunch. I needed it to be dairy free so left out the cheese sadly. Awesome! I’m so glad you love it, Shannon, and that it passed your husband’s muster, too! We eat a ton of vegetables, but I’m much more likely to make a soup vs. salad for dinner. I usually make a salad to go with a meat or vegetarian protein. So after thinking about the challenge, I thought, “What if I could find some salads that actually make me happy and have protein in them?” Enter this Italian salad! It was really delicious. I used mixed greens, as that is what I had from my CSA box–probably would have been better with romaine. And I used some green olives instead of the sun-dried tomatoes, as that is what I had in the house. But really, this was the best salad I have had in a long time and was a perfect, filling dinner, with just enough protein. I served it with some blistered padron peppers on the side (because there can never be too much heat). Thanks so much for the inspiration! You’re welcome, Tamara! I’m so glad you found what you were looking for here. I eat this at least twice a week. Cut back on the oil a tad, leave off the cheese and sun dried tomatoes (I don’t care for them). It is soooo good. I hope I never get tired of this!! I’m so glad you loved it, Pamela! I eat this one over and over again, so I hope you do, too. I made this for dinner tonight and it was delicious! We are trying to avoid dairy, so I took a hint from your inspired herbed quinoa and chickpea salad (posted on Nov 7, 2016 – I made it last week) and used olives instead. Super yum! Your list of 20 epic salad recipes from May 21 was the perfect thing to encounter at the beginning of summer – so many wonderful things to do with all of my forthcoming garden produce! I think “salad” and get bored immediately even though I know it’s the right thing to do. Your recipes help me do the right thing in a completely non-boring way and for that I thank you. I’m so glad you’ve enjoyed so many of my recipes, Darcie! You’ll love the book– lots of great salad recipes in there, too! Love this salad! The dressing is spectacular! I added some blanched asparagus and cucumber, and left out the cheese because I’m lactose intolerant. So delicious! Made this for myself and my parents (mom is vegetarian, dad isn’t) and they both loved it. I couldn’t find cubed provolone, so I just bought slices and stacked them and chopped them and it still tasted great. I think we might not love oregano as much as you, because I halved the amount of oregano in the dressing, and if I made it again, I would probably use half of that (1/2 tsp). Still, it was great and had a lovely bite. Creative problem-solving with the provolone, Hilary! And yes, I’m big on oregano, so feel free to dial that back. This salad is THE BOMB! I added some kale I needed to use up and I just couldn’t get enough!! And the dressing is perfect – will definitely be adding it to my rotation. Thanks for a delicious, simple recipe! Thanks so much. I made this without the cheese (I’m vegan) or the chickpeas (I’m also low-carb). The pepperoncini and sun-dried tomatoes were great. I enjoyed it the first day, but found the oregano and mustard tasted a little harsh. However, it got really good after the dressing sat overnight. I pressed the garlic and it was a little too strong, so I might mince it or reduce it next time. I did a little research and apparently the salad stays best in a large tupperware with some paper towels in it. It’s been 3 days and so far so good. Thanks for all the notes, Alan! I like this dressing after it has some time to mellow out, too. Alan, what do you eat for protein. I’m a vegan too, and beans are my main source of protein. Very curious. Added a few olives – otherwise as stated – delicious!!! Great, Jennifer! Thanks so much for your star review. I just had this for lunch after making it last night and storing the dressing separately, and it was a winner! I used apple cider vinegar instead of red wine vinegar in the dressing, and it was delicious (authenticity wasn’t a priority). I didn’t have raddicchio, but I’m looking forward to trying it on my next batch. Thanks Kate! This is a really good salad. It tastes like restaurant-bought, in a good way. Makes a huge amount and is very, very simple. I add Beyond Meat grilled vegan chicken strips – even better. A great, filling lunch or a light dinner. I’ll be trying the other salads. Thank you for this recipe. Love to hear that! I’m glad you thought so. I appreciate the comment. If you would like to leave a star review, that would be wonderful! There is a slim chance I’ve already rated this one…but I just made it again tonight and it was a hit! This salad is so tasty! The dressing is like “classic italian” but actually fresh and full of flavor. The boyfriend loved it too! Thank you! I will take another rating! :) Thanks so much, Elena. It’s going into the rotation. Well, thank you Fay! Thanks for the review. I really appreciate your blog post especially (ITALIAN CHOPPED SALAD) which is really helpful to me because I like to eat Italian salad. Love it! I’ve made it three times. Thanks! Wonderful! Thank you for your review. Can’t wait to try this! I’m in the UK so can’t get pepperocinis but hoping it will still be as delicious without them! Let me know what you think, PJ! Excellent! Made it for lunch today using my homegrown lettuce. Will definitely be making this salad to take to work as well. I bet it was even better with homegrown! Thanks for your review, Debbie. Truly delicious, Kate! Well done! I added some marinated artichoke hearts from Costco, subbed cucumber for celery (because I didn’t have celery on hand), and used maple syrup in lieu of honey to make the dressing vegan. I also added vegan cubed mozzarella. My husband and I are hoovering it down as I type it. Your recipes always receive the highest praise from friends and family. Thank you for all the time and effort you put into sharing your recipes. Have good day! I made this salad for Christmas Dinner at my in-law’s house. They were serving lasagna for the main dish. This salad recipe was a hit with everyone. It complemented the dinner nicely. I was even told that I’m going to have to bring this salad for every family get together now. I love that! Thanks for sharing, Ann! Absolutely Delicious! I made this for my daughter and her family as they just brought my beautiful new granddaughter into the world! It’s not always easy to feed folks who are dairy free and vegetarians, they raved about this! Thank you so much Susie H.
Congratulations, grandma! Thanks so much for sharing. Enjoy the new little one. Looks fantastic..made for tonight’s dinner. Used chopped kale instead of radicchio cause it’s what I had. Added sliced kalamata olives cause no Italian salad is complete without olives! And I left out the added sugar..looking forward to a week of great salad..will add ingredients as needed..Thanks! Thank you for sharing, Mary Anne! Thank you, this was so fresh and delicious. I loved the radicchio as it adds a nice crunch and tartness and I never buy it. I omitted the cheese and added lots of Pepita seeds, some radish and chopped raisins which help cut the overall tartness. The dressing is best if made ahead of time, It is simply delish. I added a bit more heat/red flakes to the dressing. Tomorrow this gets a bit of dry tuna topping for lunch as I think it will be a terrific match. Thanks for a great new salad to add to the rotation!!! More heat sounds like a great way to make this suit your tastes more, Jenna! Thanks for your review.